A few days ago one of my Facebook friends shared a meme that listed all the towns and cities in Britain that have Muslim mayors. The clear message was that this is a trend that ought to worry us. I thought of that message whilst reading Paul Berman’s 2004 polemic Terror and Liberalism. He has a lot to say about the complacency of Liberals and their failure to recognise the true nature of past manifestations of totalitarianism. It is, he acknowledges, easy, perhaps too easy, to attribute the actions of Islamist terrorists to some rational cause. A reaction, perhaps, to injustices inflicted by Western capitalist exploitation. Berman contends that the rise of Islamism is not that simple. Instead, it is yet another manifestation of the totalitarianism that was thought to have come to an end with the fall of the Berlin wall and the spread of democracy into Eastern Europe. His book traces the history of totalitarian movements throughout the 20th century. The Fascists in Italy, Spain and Germany; the Communists in Russia and its post-WW2 satellites; in China, South East Asia and North Korea. All are characterised by the insistence that the ideology espoused by the state must be maintained at all costs. Millions of lives are sacrificed in pursuit of the establishment of a worldwide system of control. Liberal democracy stands against such single-mindedness, insisting on freedom of thought, speech and religion, and respect for the rights of others. No single religion or ideology is permitted to have excessive influence over the state. Elections, parliaments with two or more houses, strong opposition parties able to resist unpopular policies, all ensure that the people are governed by consent. It’s not perfect, often subject to the influence of special interest groups, but debate and dissent are permitted, even encouraged. Most importantly, there is total separation between state and Church. In Britain and Ireland, the two jurisdictions with which I am most familiar, this separation dates back to the years after the English civil war in the mid-17th century. But it is a debate that is much older. 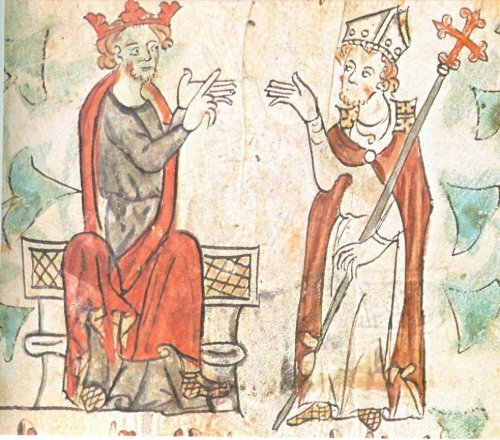 Henry II’s dispute with arch-bishop Becket, in the 12th century, was about the most appropriate distribution of power between the Church and the king. The king believed that his will was supreme within his realm. Becket insisted that the king should defer to the Pope. Although Becket was murdered for his views, he won the argument and Henry made penance and sought the Pope’s forgiveness. Berman cites a number of Islamist texts in support of his argument that it is a totalitarian philosophy, determined to spread a pure form of Islam across the world. A fundamental aspect of this form of Islam is that religion is an integral part of the state and that religious laws are the only laws permitted to prevail. For the true follower of a totalitarian philosophy the greatest honour to which one can aspire is to kill and be killed in the struggle to achieve this objective. That, according to Berman is the only explanation for Islamic terrorism. It is no use looking for rational explanations for the guiding belief is completely irrational. The book was written in the aftermath of 9/11 and revised shortly after the 2003 invasion of Iraq which Berman supported for reasons very different from those given by lying politicians like G W Bush and Tony Blair. He believed then, and apparently still believes, that it was necessary because Saddam Hussein was a dictator who exhibited the same totalitarian behaviour as the Fascist and Communist dictators of the past. His hope was that the removal of Saddam would provide an opportunity for democracy to take hold in Iraq. The evidence of the years that have elapsed since the invasion suggests that the opposite happened – the totalitarian Islamist tendency, in the shape of ISIS, has been the gainer. There is little sign of democracy arriving in Iraq or in any of a raft of Middle Eastern countries. Five years ago, the so-called Arab Spring, with the overthrow of dictators like Qaddafi, might once have been looked upon as a triumph for democracy. Again, however, the result is escalating civil strife in Libya, Egypt, Yemen and, of course, Syria and Iraq. I googled around to try to see what Berman has had to say about these events and found surprisingly little. His most recent article concerns the French ban of the ‘burqini’ (now lifted). There is one other thing I need to say about this book and its author. My googling revealed many admirers and a few detractors. Most of the latter argue that because he is a Jew, nothing he says about the Middle East can be trusted. It is in that spirit that we should respond to the idea that a handful of the people holding elected office in British local authorities are Muslim. We should be proud that it is more than 120 years since the first Asian was elected to the British House of Commons. He was, after all, a member of the Liberal Party. By franklparker in Reviews, World Affairs on September 6, 2016 .